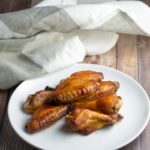 One of my favorite ways to make wings: a quick and easy recipe for marinated and oven-baked Asian chicken wings. To make the marinade, add all ingredients except for the chicken wings to a large bowl. Whisk together until everything's well combined. Place chicken wings in a glass dish and pour the marinade over the wings. Stir to coat all the pieces of chicken. Cover the dish with plastic wrap and refrigerate for a minimum of 2 hours, or up to 12 hours. Preheat oven to 400°F. Place wire racks on top of 2 rimmed baking sheets. (Line the baking sheets with foil for easier cleanup!) Divide wings between the two racks and spread them out in a single layer. Bake wings for 45-50 minutes, until skin is crispy.